A savoury appetizer from Gujarat India, khandvi is made from gram flour and yogurt. The procedure to prepare looks easy enough, but it does require some practice to roll the perfect khandvi. I spoilt my first lot but got it kind of okay the second time. My tip, cook slowly and roll lightly. Taste wise it was a great hit with my kids. 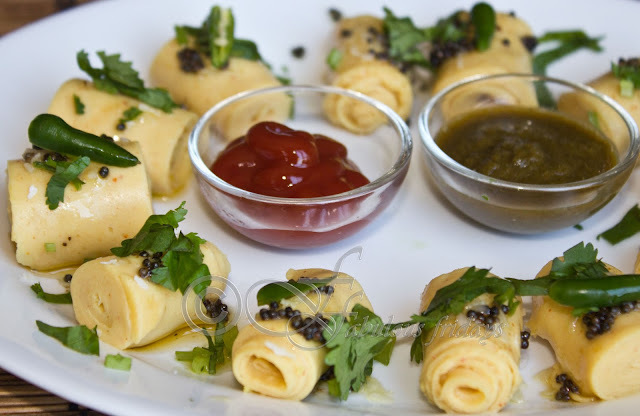 You can also prepare stuffed khandvi by spreading green chutney over the spread out batter before rolling. In a pan mix besan, yogurt, water, salt, sugar, ginger paste and green chilies together to form a smooth batter with no lumps. Cook on low heat stirring continuously to avoid any burning or lumps. Cook till batter is slightly thick. To test if the batter is perfectly cook, take a tsp of batter and spread on a greased flat surface (plate) evenly. After a few seconds try to roll the spread part. If it comes out easily then the batter is perfectly cook, if not let it cook for more time and then test again. Once batter is perfectly cooked, spread it on a greased flat surface evenly. I used the back of a steel plate. Spread evenly and work quickly so that you are able to spread the batter before it gets cold. Sprinkle grated coconut on top. Cut into 1 Inch strips and roll them. Heat oil in a small pan, add asafoetida and mustard seeds, let crackle for 3-4 seconds. Take away from heat and cool a bit. Add lime juice and mix well. 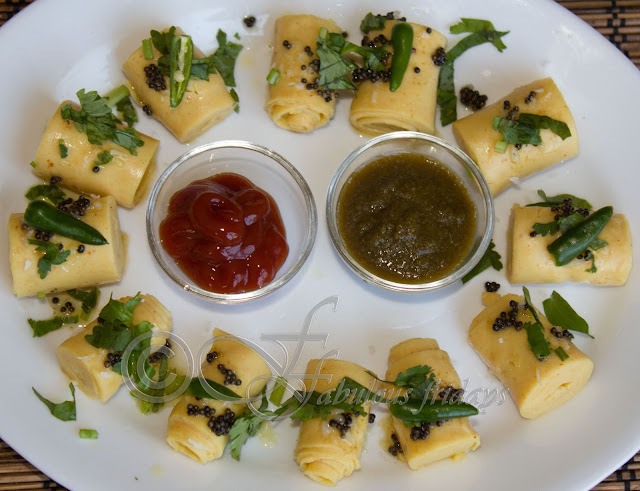 Temper (तड़का) evenly all over the rolled out khandvi. Garnish with coriander and slit green chilies. Serve with red and green chutneys. Can be made a day ahead, store in the refrigerator.